Seven gold medals will be up for grabs as the 13th Chinese National Games kicked off last night in Tianjin. Ding Ning carrying the flag for Beijing at the 2017 Chinese National Games. 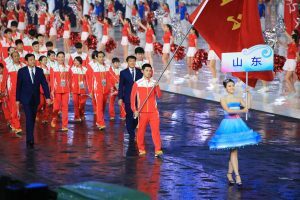 The opening ceremony for the 13th Chinese National Games was held last night in the Tianjin Olympic Center and table tennis took centre stage as Zhang Jike and Ding Ning were flag bearers for the teams from Shandong and Beijing respectively. Ding Ning will be competing in the Singles and Team events and also teaming up with Liu Shiwen in the Women’s Doubles. Zhang Jike once again carried the flag for Shandong. For Zhang Jike it was the second time he was given the honour to carry the flag for Shandong. Although we won’t see the Grand Slam Champion in action in the teams event, Zhang will be competing in the singles and doubles. The biggest names from China’s national team will make a showing at the Games, with Ma Long, Fan Zhendong, Xu Xin, Liu Shiwen, Chen Meng and Zhu Yuling all taking part. There will be seven gold medals up for grabs in table tennis, with the events running from August 28th – September 6th. A total of 31 sports will be on display at the Chinese National Games, with 341 events taking place.